مقاله حاضر به بررسی ترس از جرم و اثر مصرف رسانه‌ای بر آن می‌پردازد. داده‌های پژوهش از طریق پیمایش و با استفاده از پرسشنامه محقق‌ساخته جمع‌آوری شده است. جامعه آماری، شهروندان 15 سال و بالاتر شهر تهران، روش نمونه‌گیری، خوشه‌ای چندمرحله‌ای و نمونه انتخاب شده، 1196 نفر است. چارچوب نظری تحقیق مبتنی بر نظریه کاشت گربنر است که به طور خلاصه عنوان می‌کند؛ تماشای بیشتر تلویزیون به ترس بیشتر افراد از جرم می‌انجامد. نتایج حاکی از آن است در حالی ‌که مصرف رسانه‌ای به طور کلی، با ترس از جرم رابطه نداشته؛ مصرف رسانه‌های جدید (اینترنت، ماهواره و شبکه‌های اجتماعی مجازی) با ترس از جرم، مرتبط بوده است. همچنین پیگیری اخبار جرم از رسانه‌ها به طور معناداری با ترس از جرم ارتباط داشته است؛ هرچند این روابط به صورت غیرخطی و ضعیف است. علاوه بر این، در حالی‌ که پیگیری اخبار جرم از رسانه‌ها به افزایش ترس از جرایم جانی منجر نمی‌شود، به طور معناداری ترس از جرایم مالی را افزایش می‌دهد. 1Associate prof. in Sociology, Payam Noor Uni. 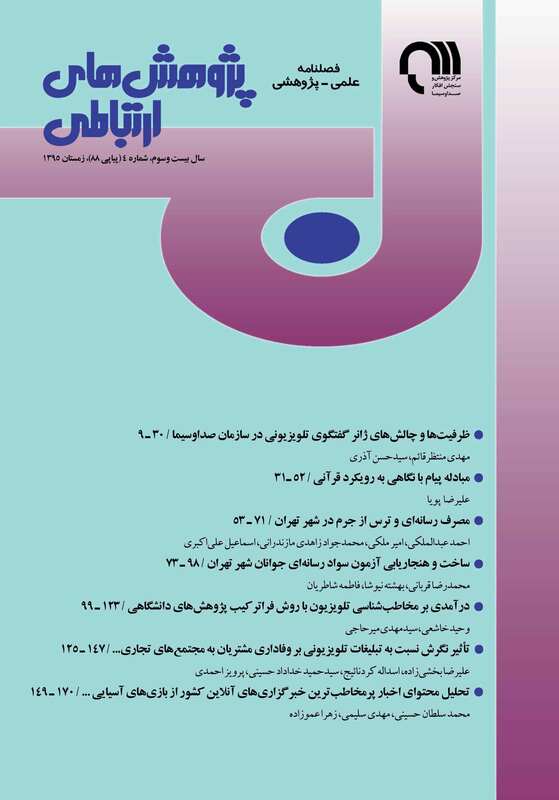 2Associate prof. in Sociology, Payam Noor Uni. 3Geography & Urban Planning, Payam Noor Uni. The article deals with the fear of crime and the media consumption effects on it. The research data were collected through survey employing questionnaire. The research population encompasses all citizens at 15 years and older in Tehran. Sampling conducted based on Multi-stage cluster method and the number of 1196. Theoretical framework is based on cultivation theory arguing: the more people watch television the more they fear of crime. The results indicate that although overall media consumption is not related to fear of crime, but the use of new media (Internet, satellite channels and virtual social networks) is related to the fear of crime. In addition although nonlinear and weak, tracing crime news from mass media significantly associated with fear of crime. Furthermore, although tracing crime news from mass media doesn't lead to more fear of homicide crimes, significantly increases the fear of financial crimes. احمدی، محمد و کلدی علیرضا. (1391). بررسی احساس امنیت اجتماعی زنان در شهر سنندج و عوامل اجتماعی مؤثر بر آن. فصلنامه علمی پژوهشی زن و جامعه، 3 (4). بیات، بهرام. (1388). تبیین جامعه‌شناختی احساس امنیت در بین شهروندان تهرانی (با تأکید بر نقش پرداخت رسانه‌ای و سرمایه اجتماعی). نامه علوم اجتماعی، 35. علی‌خواه، فردین و نجیبی ربیعی، مریم. (1385). زنان و ترس از جرم در فضاهای شهری. فصلنامه پژوهشی رفاه، 6 (22). Callanan, V. (2005). Feeding the Fear of Crime: Crime-related Media and Support for Three Strikes, LFB Scholarly Publishing, New York. Chiricos, T.; Padgett, K.& . Gertz, M. (2000). Fear, TV news, and the Reality of Crime. Criminology,Vol.38 , No. 3, Pp. 755-786. Comstock, G.; Chaffee, S.; Katzman, N.; McCombs, M. & Roberts, D. (1978). Television and Human Behavior. New York: Columbia University Press. Doob, A. & Macdonald, G. (1979). Television Viewing and fear of Victimization: Is the Relationship causal?. Journal of Personality and Social Psychology, Vol. 37, No. 2, Pp. 170-179. Erdönmez, E. (2009). The Effect of Media on Citizens, Fear of Crime in Turkey. Unpublished Doctoral Dissertation. Texas: University of North Texas. Ferraro, K.F. & Lagrange, R. (1987). The Measurement of Fear of Crime. Sociological Inquiry, 57, Pp.70–101. Gerbner ,G. & Gross, L. (1976) .Living with Television: The Violence Profile. Journal of Communication, 26, Pp. 173-199. Gerbner, G.; Gross, L.; Morgan, M. & Signorielli, N. (1980). The Main Streaming of America:Violence profile, No. 11. Journal of Communication, 30, Pp. 10-27. Haghighi, B. & Sorensen, J. (1996). American'sfear of Crime. In T. J. Flanaganand D. R. Longmire (Eds. ), Americans View Crime and Justice: a National Public Opinion Survey, Pp. 16-30, Thousands Oaks, CA: Sage. Heath, L. & Petraitis. J. (1987). Television Viewing and Fear of Crime: Where Is the Mean World?, Basic and Applied Social Psychology, 8, Pp. 97–123. Jamieson, P. E. & Romer, D. (2014). Violence in Popular U.S. Prime Time TV Dramas and the Cultivation of Fear: A Time Series Analysis, Media and Communication, Vol. 2. Kalar, S. (2004). The Impact of Child-Directed Media Consumption on Consumer Intelligence, The University of Texas at Austin. Kohm, S. A.; Waid-Lindberg, C. A.; Weinrath, M.; Shelley, T. O. & Dobbs, R. R. (2012). The Impact of Media on Fear of Crime Among University Students: A Cross-National Comparison, Canadian Journal of Criminology and Criminal Justice, 67. Kort-Butler, L. A. & Hartshorn, K. J. S. (2011). Watching the Detectives: Crime Programming, fear of Crime, and Attitudes about the Criminal justice System. The Sociological Quarterly, 52, Pp. 36-55. Morgan, M. & Shanahan, J. (2010). The State of Cultivation. Journal of Broadcasting & Electronic Media, Vol. 54, No. 2, Pp. 337-355. Skogan, W. & Maxfield, M. (1981). Coping with Crime: Individual and Neighbourhood Reactions. Beverly Hills: SAGE Publications. Sotirovic, M. (2001). Affective and Cognitive Processes as Mediators of Media Influences on Crime-policy preferences, Mass Communication & Society, Vol. 4, No. 3, Pp. 311-329. Truman, J .L. (2005). Predictors of Fear of Crime and the Relationship of Crime Rates and Fear of Crime. The University of Central Florida Undergraduate Research Journal, Vol. 1, Pp.18–27. Warr, M. (1994). Public Perceptions and Reactions to Violent Offending and Victimisation, in Reiss, A., and Roth, J. (eds.) Understanding and Preventing Violence, Vol. 4: Consequences and Control. Washington D.C.: National Academy Press. Warr, M. (2008). Crime on the Rise? Public Perception of Crime Remains out of sync with Reality, Criminologist Contends. Williams, P. & Dickinson, J. (1993). Fear of Crime: Read all about it? The Relationship Between Newspaper Crime Reporting and fear of Crime. British Journal of Criminology, Vol. 33, No.1, Pp. 33-56.